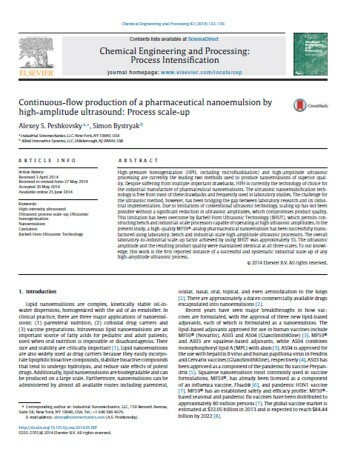 Ultrasonic disruption of yeast and other microbial cell cultures is commonly used for laboratory-scale protein preparations because it is rapid, efficient and simple to use compared to such methods as high-pressure homogenization (HPH) and bead milling. Lysing by sonication is also more effective than other cell disruption methods for the recovery of periplasmic, membrane-bound, or insoluble recombinant proteins. 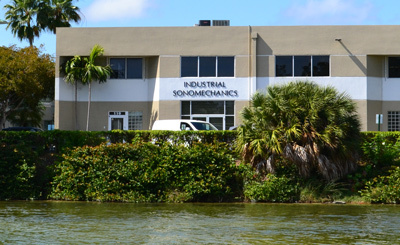 Until recently, however, due to amplitude limitations of conventional-design pilot and industrial-size sonication equipment, ultrasonic cell disruption was only feasible on the laboratory scale. 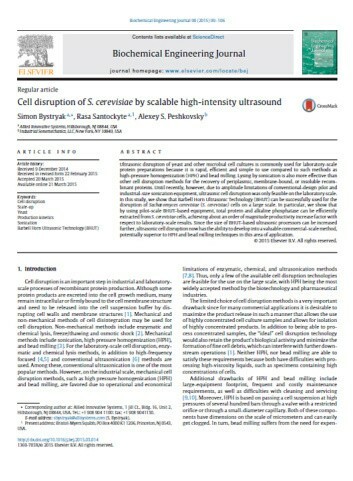 In this study, we show that Barbell Horn Ultrasonic Technology (BHUT) can be successfully used for the disruption of Sacharomyces cerevisiae (S. cerevisiae) cells on a large scale. A sealed piezoelectric transducer having a single, uniform, electrically insulating, heat-conducting layer of a soft, rubbery material filled with a fine, homogeneously-dispersed powder having high thermal conductivity. The material is placed in contact with the surfaces of the transducer and conducts the heat from the surfaces to an external heat sink. Since the thermally conductive powder is fully encapsulated in the rubbery material, its abrasive properties are neutralized. The softness of the material ensures that the vibration of the transducer does not transmit significant acoustic energy into the material, thereby avoiding the generation of parasitic heat. In addition, the layer fills the entire gap between the transducer and the heat sink, thereby removing any possibility of moisture-related arcing. 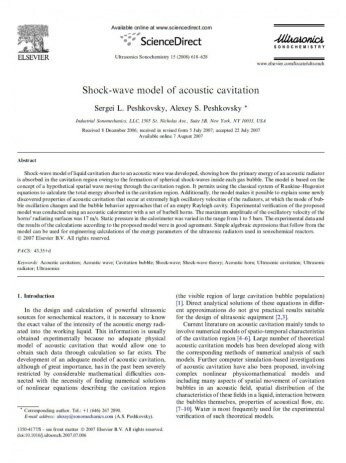 Shock-wave model of liquid cavitation due to an acoustic wave was developed, showing how the primary energy of an acoustic radiator is absorbed in the cavitation region owing to the formation of spherical shock-waves inside each gas bubble. The model is based on the concept of a hypothetical spatial wave moving through the cavitation region. It permits using the classical system of Rankine–Hugoniot equations to calculate the total energy absorbed in the cavitation region. 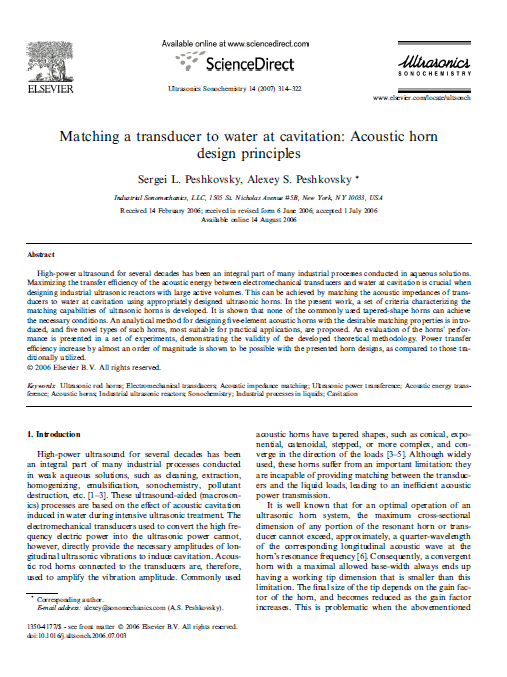 Additionally, the model makes it possible to explain some newly discovered properties of acoustic cavitation that occur at extremely high oscillatory velocities of the radiators, at which the mode of bubble oscillation changes and the bubble behavior approaches that of an empty Rayleigh cavity.